The VMCC was formed in 1946 by a band of 38 enthusiasts and now boasts a Worldwide membership of over 14,000! However this figure has been achieved without losing any of the camaraderie or helpfulness which is usually associated with smaller clubs & you can receive specialist advice on every aspect of owning an older motorcycle. But don't let the word "Vintage" fool you! Whilst catering for the very oldest pioneer machines the majority of our members ride post war-classics with many also owning modern machines as part of their "stable". We cater for enthusiasts of all ages and levels of experience & you don't even have to own a motorcycle to become a member! Monthly full colour 60 page+ magazine "The Vintage & Classic Motorcycle" delivered direct to your door. 86 Local & Non Territorial Sections throughout the UK with a full programme of events catering for all interests both sporting & social. With many more geographical sections than any other club you will never be far away from meeting up with people just like you. Discount insurance services via Club partner Footman James (0333 207 6069). VMCC members find they can re-coup their membership fees many times over with the discounts offered. Over 130 Marque specialists who are able to assist with member queries relating to almost every make & model motorcycle ever produced! The largest Library of material in the world relating to our motorcycling Heritage. The collection includes all the original factory dispatch records from the like of BSA, Norton & Triumph. With over 35,000 items & full time Library team we can help with all your motorcycling questions whether you are restoring, registering or researching. VMCC Members receive both free access & discounted rates on multiple/more extensive research. 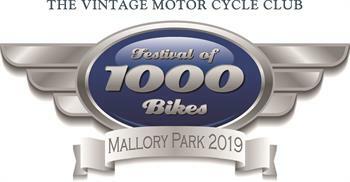 Run & The Festival of 1000 Bikes. As a member you even get the opportunity to ride a closed roads lap during the IOM Classic TT week-something else which is unique to the VMCC. The above are just some of the principle benefits to be gained from joining the other 14,000 VMCC members around the world. Why not join them to share in the many unique activities, specialist knowledge and camaraderie that membership brings. *Family members must live at the same house hold as the full paying member.